The late Albert Wabasse was a Chief in the 1930's and 1950's. He worked closely with Xavier Sofea. Albert Wabasse passed away in the 1980's. The late Edward Spence built two churches during his service as catechist. He became an ordained Anglican minister in his later years. Along with Simon Jacob, they were both very protective of the Anglican church and turned away other denominations from making inroads into the community. Edward Spence passed away in 1980 from cancer. The late Simon Jacob served as Chief for a number of years and worked alongside Edward Spence. In addition to being a Chief, Simon was also a church catechist. Known to be very strict about the Christian lifestyle, he also ruled his community with a strong hand. The late Adam Suganaqueb is a prominent figure in Webequies history as a trapper, hunter and good provider. Known for his storytelling, he was also a teacher of the people from the 60's to the 80's. He passed away in 1988. The late Nancy Jacob was an outstanding woman and has a prominent place in our past. As a midwife, she delivered half the adult population of Webequie. She is one of the few known to possess the title of medicine woman. according to our traditions, anyone possessing the title "medicine" is considered to have special powers and is very knowledgeable in the use of traditional herbal medicines, and is very skillful in the healing arts. 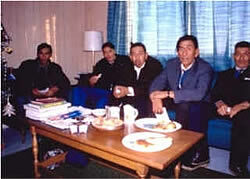 The late Solomon Suganaqueb was a Chief for Webequie First Nation and focused on economic and community development. Considered a great leader and recognized for his wisdom, Solomon was a astute visionary and believed in a better future for further generations. He was also a storyteller, a trait he inherited from his father, the late Adam Suganaqueb. He was always able to bring laughter, and inspire people in times of difficulty. Solomon Suganaqueb passed away at the age of 61 due to cancer. His motto was "use the gifts you receive, there is a reason." The late Xavier Sofea , a catechist, built the first church in Webequie. He also worked closely with the Chief as an advisor. Xavier Sofea passed away in the early 1960's.